For bloggers who just want to write. Carbon lets you earn money while you focus on what you do best. Think of us as your partner in growth. Our team manages ad sales and campaigns, working with hand-picked advertisers such as Google, MOO, Adobe, and HelloSign. You can relax knowing ads provide value to visitors, are relevant to your content, and respect your website's UX. Monitor your revenue and get monthly payouts from your private dashboard. Keep your content front and center. User experience is at the core of the Carbon network. 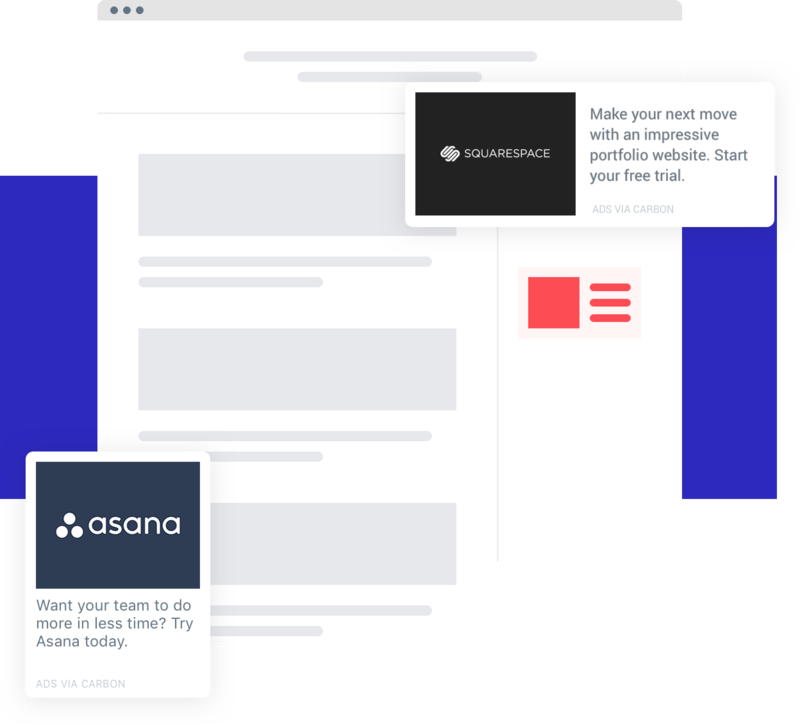 Our native ads only feature relevant advertisers, are fully customizable, and never distract readers from your content. Ad formats are non-intrusive and protect website user experience. Featured advertisers are relevant to your audience and content. You can customize the CSS in any way you see fit. Join a community of passionate creators. The Carbon network is filled with people who are passionate about what they're working on, whether it's an app, website, blog, forum, or something else entirely. Interested in joining Carbon? Let's connect. We're always looking for writers and bloggers who are active in the tech community and passionate about what they do. Just add your information and we'll be in touch.